One more thing that just may be important. There’s water on Mars. Scientists believe there were once ancient seas covering part of the Martian surface. But it’s not there now – at least not that we can see. Perhaps as the atmosphere thinned, much of the water evaporated into space. But not all. Some water remains frozen at the Martian poles (that’s what makes that polar ice cap white). And more water may be trapped underground. In fact, the rover Spirit accidentally uncovered evidence of liquid H2O activity just inches beneath the surface. 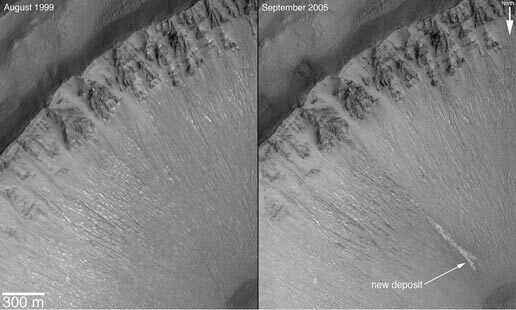 And NASA photographs show signs that water flowed on the surface of Mars very recently. Since 1999. Look. And where there’s water, there may be LIFE! So keep your eyes and ears open as we continue to explore Mars. There may be some lively discoveries! And come back next post for your day 1 picture clue to get you started on the puzzling question: Where in the Solar System is Destination Nine? Newcomers: To join in, check out Space Game Rules! This entry was posted in Destination Eight, Mars, Mars Rover, Mars Science Laboratory, Planets, Solar System, Space, Space Exploration, Space Game. Bookmark the permalink. I used to think I had no opinion on whether or not we would discover life elsewhere in the universe, but lately I’ve been thinking more and more that we most likely will discover life of some sort, and probably in our own universe. I can’t remember why exactly I’ve decided that – ice worms in ice bergs? another step connection discovered between viruses (no life on their own, as they need another living thing to reproduce) and other living things – I can’t remember. Seems like it was a recent discovery though…. Thanks for sharing your thoughts, Erin Ivy. I agree it’s particularly intriguing to think about the possibility of life like us. But even the existence of simple life forms might indicate that we could survive on another world. Do you find that interesting to think about? That’s a fascinating topic to think about, Aidoboy. And it’s something space scientists around the world are wondering, too. But before they even get there they’re asking a question so basic it seems almost silly: What is life? We know what it is on Earth, but would we recognize an alien life form on Mars? Check out this NASA feature if you want to know what they’re thinking. And definitely let us know what you think life on Mars might look like. Thanks for the great comment!